Since 2005, Buy Sheds Direct have been trading and now they are seen as one of the very best garden specialists in the whole of the UK. While they have sheds in their name, sheds are far from the only thing that they offer. Do not get us wrong, they have a fantastic selection of sheds of all sizes, but there is far more to them then just that. For example, they have a tremendous selection of summerhouses and log cabins for those of you who want to have a nice space to kick back and relax in your garden. Also, if you have little ones who like to tear up the house, then get them to go outside with one of their epic children’s playhouses. Pergolas, greenhouses, workshops and gazebos are just a few of the other things that are sold by Buy Sheds Direct. Honestly, you could spend ages and have a great time just looking at all the items they offer. We have already reviewed Buy Sheds Direct and found them to be a very good garden retailer. One of the best things about all the time we spent looking at Buy Sheds Direct was that we found the best ways for you to save money. We are not just talking about Buy Sheds Direct vouchers or discount codes, but simply ways that you can get the best deal possible when purchasing a structure or even just an accessory from Buy Sheds Direct. There are many other sites online that claim to have the ultimate Buy Sheds Direct discount codes, but turn out to be less than fantastic. Well we can assure you that the tips we have below will ensure that you get the best Buy Sheds Direct deal possible. We know that if you have come to this page you are looking for a discount code for Buy Sheds Direct, as we explain further up Buy Sheds Direct dont often issue discount code. As such we thought you might like to see what are some of the best discounts that are currently on offer from other garden building retailers. The 5 tips that 90% of people who SAVE money at Buy Sheds Direct use! Just below are the ways that have been proven to ensure people make their money go as far as possible when it comes to Buy Sheds Direct. We all want to get the best deal possible and while we wish that many of these Buy Sheds Direct vouchers were legit and worked, the fact is many of them just waste your time. At WhatShed we want to make sure your purchasing of a new shed, greenhouse or whatever it is you are looking for, is as easy as possible and that is why we are giving you these great ways to save some money when purchasing from Buy Sheds Direct. One thing we want to mention before we start, is that Buy Sheds Direct offer free delivery to most parts of the UK as standard, so there is no need for any kind of code to get this. Always check the latest Buy Sheds Direct Sale: There is always some kind of Buy Sheds Direct sale going on and one of the things that we love about it, is the way that they make sure to clearly have their sale listed on the front page of the website. We know first hand that in some cases many shed retailers do not make much profit on their sheds, so to see Buy Sheds Direct give as much as 35% off some of their items is just incredible and makes this one of the better sales that we have seen. If you want to make sure you are getting the best deal possible that does not waste your time dealing with these make believe Buy Sheds Direct voucher codes, then their sale page should be the first place you check out. One thing to note about the Buy Sheds Direct sale is that it does quite often change. For example, as of us writing this guide they are having what they call their ‘Red Shed Sale’, which has not just sheds, but also greenhouses, storage boxes and many other items for sale as well. 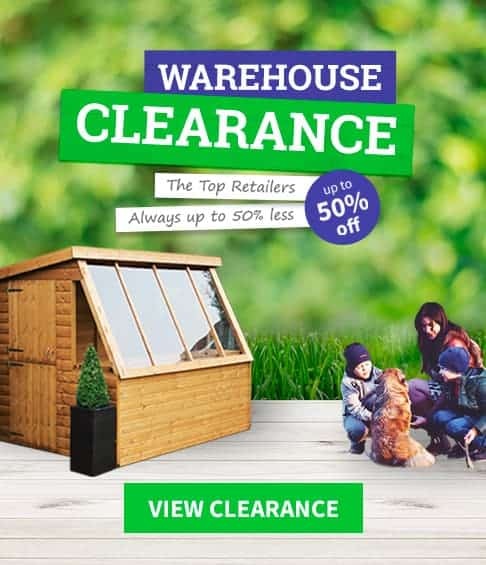 We must say that this is one of the more impressive sales that we have seen a garden retailer offer. Save Money With Their Buy Sheds Direct Voucher Code: If we told you how many hours we have wasted checking various Buy Sheds Direct voucher codes, you would probably say that we need to get out more. But in all our checking, we realised that we should have just gone direct first of all as right on their homepage they have their latest discount code that is going to save you money. As of writing, they are offering you 5% off orders that are £750 or more. You just need to use the code BASKET5 when you check out to make sure you have a little more extra money in your pocket. This code will change from time to time so be sure to always look and see what their latest code is offering. They Offer Interest Free Credit: We know that when you start looking for a shed, you may have a nice little 4 X 6 overlap shed in mind, but this can be thrown out the window when you see some of the larger, more impressive and sadly more expensive sheds that are on offer at Buy Sheds Direct. One way though to be able to get a more expensive shed without having to whack it on a credit card, is to take advantage of the interest free credit that Buy Sheds Direct offer. This lets you spread the cost of a more expensive shed, summerhouse, playhouse or whatever over three months, which is far better than getting pounded with interest on your credit card. Use Facebook To See Their Latest Offers: Here at WhatShed, we are not against the odd bit of Facebook gossip, but Facebook can be used for far more than that. Such as keeping up to day on what the latest offers are at Buy Sheds Direct. What we like about their Facebook page is that when they do have a new sale, or if there is a new Buy Sheds Direct voucher code on the go, then it is going to be posted here first. As well as getting info about their latest deals and offers, we found that their Facebook page was also great for just keeping up to date about what latest items they have in stock. And as an added bonus, as well as making sure you are getting the best deal, you can use their Facebook page to get all kinds of cool DIY ideas. By the way, if Twitter is more your thing then they do also give information about their latest deals and offers on their official Twitter page. Save Money By Signing Up For Their Newsletter: Now we normally would say stay away from sites that offer you Buy Sheds Direct discount codes via signing up for some newsletter, but this is the official site we are talking about here and as well as giving you the latest deals as soon as they happen. You will also get £10 off your first order over £300. Now, £10 does not sound like a huge discount, but it is better in your pocket than their bank account, so we say take the time to just give them your email address and get that £10 back! A round-up of all the current Buy Sheds Direct voucher codes we found online. Here at WhatShed, we do not just want to make sure you are well informed about various garden structures, we also want to make sure that you are getting the best deal possible and not having your time wasted by sites offering Buy Sheds Direct vouchers that do not actually do anything! We have taken our time and looked at the most popular voucher code sites that claim to save you money when dealing with Buy Sheds Direct. By doing this, there is no need for you to waste your time, get angry and hit your keyboard when that too good to be true Buy Sheds Direct discount code turns out to be fake or long expired. We rolled up our sleeves and had a real good look around and used the following search terms to see who is offering supposed codes, vouchers and deals for Buy Sheds Direct. The search terms we used to get these sites were: Buy Sheds Direct Voucher Codes, Buy Sheds Direct Coupon code, Buy Sheds Direct Current Discounts, Buy Sheds Direct Current Voucher Codes and Buy Sheds Direct Sale. Below are the sites that claim to offer amazing codes, but left us feeling very disappointed. Hopefully, by looking at this list, you will not waste your time trying these old or just plain fake discount codes. Look For Expired Codes! Before we start with our list, we want to tell you to keep an eye out for expired Buy Sheds Direct voucher codes. Many sites as you will see, use old codes to make it look like they have more offers and deals than they really do! UKPromoPro.co.uk – Lots of expired codes! What they claim? UKPromoPro.co.uk to be fair to them are really not claiming anything on their Buy Sheds Direct voucher codes section. They just have a large list of various Buy Sheds Direct deals. They have two different sections on their site. One of these is for codes that are valid and the other is for expired codes. Their expired codes section really annoys us as they say that they might work. We hate when sites do this, as it gives people false hope and just wastes their time. So do not let your time be wasted by trying these old expired Buy Sheds Direct discount codes. What We Found? Before we tear into them for having a section dedicated to old codes that appears to be there to do nothing more than just waste your time, we must say that at least the voucher code they have and the information about the latest Buy Sheds Direct sale is up to date as of writing. But the rest of their current section is just filled with deals that you get directly on the Buy Sheds Direct site, so it is a waste of your time clicking on them here. Go direct and save yourself the time and headache. What they claim? On this site, they claim to have Buy Sheds Direct vouchers for 2016. Actually they go even further than that by claiming that they are for March 2016. Which by the way is when we are writing this guide, so as far as MyVoucherCodes.co.uk go, they are pretty sure that the Buy Sheds Direct discount codes that they have are the very latest ones. There is no expired codes section to waste your time which we are thankful, but the deals they do have are still not exactly worth your time. What We Found? Now to be fair, MyVoucherCodes.co.uk have at the least made sure to have the current deals that Buy Sheds Direct have listed on their site. However, this does not mean we are saying this site is awesome and you should head there before you go to purchase a new shed. You see, this is a site that just takes the deals that are already clearly listed on Buy Sheds Direct, which we feel is just a waste of your time as you can get the same deal by just going to the Buy Sheds Direct website. Fyvor.com – They list the same code time and time again! What they claim? Honestly, we have no idea! This is one rather confusing and busy website that left us scratching our heads. They have a section about their Buy Sheds Direct coupons, but they do not actually give you any info. All it is, is just a little bit of backstory about Buy Sheds Direct. On the side banner of their site, they have all these random “sales” listed such as Spring Vacation Sale, Mother’s Day Sale and Canadian Spring Vacation to name a few. These seem really out of place and in general this was a site that we really did not know how to take. What We Found? There are two things that bugged us about this site. First of all, they list the same deal over and over again, but they reword it so it sounds like a different deal. This we feel is kind of sneaky and will in the long run just waste people’s time and still not result in them saving any money. The other thing that we did not like, was how they listed just random products from Buy Sheds Direct such as the 8 x 6 Shire Apex Durham Single Door Shed (which is awesome by the way), but make out that they have this special deal where you can get it for £299.99 when actually this is just the price Buy Sheds Direct are selling it for! They do this for far more products than we would like to see. You will not save a penny more by coming here before you go to Buy Sheds Direct. What they claim? MinistryOfDeals.com claim to list tried and tested Buy Sheds Direct vouchers as well as deals and the latest discount codes. They also claim to be as up to date as possible and they do have a section dedicated to Buy Sheds Direct deals that are happening for whatever month it is. What We Found? We found that in the section that they claim has the most up to date Buy Sheds Direct coupons and discount codes, that these were the current deals being offered by the folks at Buy Sheds Direct. The problem is, these deals are easily found on the homepage of the official Buy Sheds Direct site, so there is no need to come here at all. They also have a section of codes that are expired and also proven to be unreliable, but they at least tell you these have been classed as unreliable and expired codes. Which makes us ask the question, why have them there in the first place? It is just pointless and unfortunately some people will waste their time clicking on them all with the hopes of finding one that still works. Trust us, expired codes never work! What they claim? DealsDaddy.co.uk is one of the easier to use sites that claim to have the best Buy Sheds Direct discount codes. As a matter of fact, after they have told you how incredible the sheds and other products that are being sold by Buy Sheds Direct are, they also tell you that you can get a shed or whatever at an astounding discounted rate by using a code. What We Found? Thankfully there is not a ton of old and expired codes that you have to look through here, but once again the Buy Sheds Direct vouchers that they do have here which are valid are all available on the official site! This is so frustrating to see time and time again as we know it is just going to waste people’s time and also get their hopes up that they have stumbled across some incredible deal. Speaking of deals, the Buy Sheds Direct deals that are listed here are very annoying. For example, they have a “deal” where you can get a fantastic 6 X 6 Shire Shed for a very good price, but when you click on this deal it does not even take you to that particular shed. It just takes you to the Buy Sheds Direct site so you would still have to search around there to find it. While not the worst site we have seen, we would still say it is a huge waste of your time. What they claim? At first, VoucherSlug.co.uk really do not make any bold claims. As a matter of fact they even suggest that you check out Buy Sheds Direct Twitter and Facebook pages, which we give them credit for. But once you start to scroll down the page and you get past what they class as their current Buy Sheds Direct voucher codes, you will come to a section that has expired codes. Many sites still list expired codes and it is a major annoyance of ours. What makes it worse is that they say that these codes “may still work” which we really do not like. What We Found? We found that while they have managed to keep up with the current Buy Sheds Direct deals, they still do not have anything listed here that you cannot get directly through the Buy Sheds Direct website. On top of this, the fact that they claim their old codes may still work makes this a site we would advise you stay away from when trying to get the best deal from Buy Sheds Direct. They even have codes for other sites just below their expired codes section, which some people may click on accidentally thinking they are getting a sweet deal at Buy Sheds Direct, when in fact they are not at all. SaveOpedia.com – Has a code that just does not work! What they claim? One of the first things you will notice about SaveOpedia.com, is that they are making pretty bold claims about how they have the latest Buy Sheds Direct discount codes and deals. On this site, they have two different ways of trying to get you to use them. One is they have codes and the other is their promos. They claim that these will get you great deals and save you money, but truth be told it is just the exact same deals you see on the homepage of Buy Sheds Direct. What We Found? They do not have a ton of different Buy Sheds Direct vouchers for you here. Actually, the one that they do have which actually works is the same as the one you see pretty much slap bang in the middle of the actually Buy Sheds Direct homepage. What really grinds our gears about this site is that most of their promos that you click on just take you to the general sale page of the Buy Sheds Direct website. This is a site that we feel would be just a huge waste of your time. What they claim? VoucherCodes.co.uk claim to have Buy Sheds Direct vouchers for the current month that it is. So if you were to go on in say December, then they would have Buy Sheds Direct discount codes that are valid for December. This is quite the claim and we can only imagine it must be hard for them to keep on top of this. But they are very confident as they do say that if their codes do not work that dinner is on them. Which is cute, but we doubt this would hold up in a court of law, so do not think you are going to get a free Burger King when you have tried to save money on one of their codes. What We Found? Now the reason that they are able to be so confident in their Buy Sheds Direct offers, is that they only list the deals that are on the homepage of Buy Sheds Direct. There are no special or exclusive deals, so it really is a waste of your time coming here. Also they have random codes and deals for different sites that they feel may interest you. This is something that we really do not like, as you are looking for a code for Buy Sheds Direct, not trying to save £1 on a lap from some random store. EVoucherCodesUK.com – All their deals link you to the exact same page! What they claim? This is one of those sites that does not actually make all these bold claims that they have the very latest Buy Sheds Direct discount codes or exclusive deals. They just have a rather long list of different deals that they claim will save you money or get you some kind of structure for a great price. What We Found? The deals that they have on EVoucherCodesUK that are actually valid are just the same ones you see when you go to Buy Sheds Directs website. So that right there tells you coming here is a waste of time. What makes it worse though, is that no matter what you click on, you are just taken to the same page. So if you click on their deal to get a workshop at a discounted price, you are taken to the same page as if you were to click on getting a log cabin for a discounted price. This to us seems like they just list random products as a way to make it seem like they are offering more deals than other sites. Quidco.com – They require you to sign up just to see what they offer! What they claim? Up to 5% cash back is what you can potentially get when you sign up to Quidco. They say that you would buy whatever it was you wanted to buy from Buy Sheds Direct and then you would claim back your 5% or whatever it is from them after. What We Found? This is hard to say, as they will not let you see any information at all unless you sign up for their site. We do not doubt that for some things this is great, but we do not feel you will get any better deal by signing up here than you would just going straight to the Buy Sheds Direct website. The reason we have put Quidco on our list, is that when you search for a Buy Sheds Direct voucher code, they are one of the first ten sites that pop up on Google and we would hate to see you guys signing up to them and then not being any better off for it.